Derek Roche, a 2003 graduate of UNCG's Consumer, Apparel and Retail Studies (CARS) program, stopped by his alma mater to offer a little career advice to CARS students. Roche is personal stylist to hip-hop artist Sean Combs. Ten years as personal stylist to Sean (“Brother Love,” formerly “Puff Daddy”) Combs, and alumnus Derek Roche rarely leaves home for a video shoot or red carpet event without the costume design textbook he used as an undergraduate in UNC Greensboro’s Department of Consumer, Apparel, and Retail Studies (CARS). 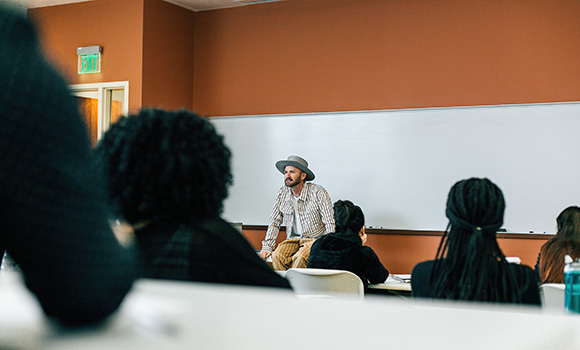 “If you want to be the expert and compete with those kids at Parsons (The New School, New York) and FIT (Fashion Institute of Technology, New York), pay attention and learn the first go-around,” Roche said when he spoke at UNCG on Monday during CARS’ final Alumni Industry Speaker Series of the year. The 37-year-old celebrity stylist from Goldsboro, who has dressed singer Nicki Minaj and basketball star Kobe Bryant, spoke fast, but not without a North Carolina drawl. Roche’s business savvy is an important thread woven throughout the story of his rise to the top of the fashion world – beginning at UNCG. Shortly after entering the speech pathology program, a friend encouraged Roche to check out Textile Products Design and Marketing (a former name for CARS). He was spending weekends at Greensboro’s Design Archives and Carolina Thrift, bleaching and cutting jeans to style his buddies, dressing them in everything from peppermints to saran wrap. That summer, Roche kept a notebook in his back pocket. When he heard a name or business, he jotted it down. After work, he walked the streets of Manhattan until his feet ached, returning to his dorm room to scour the internet for more information. The tools he gained from CARS catapulted Roche from Field to Vibe Magazine, onto Macy’s, Nike, Estee Lauder and Conde Nast before a two-month interview process with “Puff” (Roche’s nickname for Combs). Whatever area of fashion you want to be in, you need to be the expert. If you want to be a stylist, you have to figure out how to be part of that community. Get involved – you can’t have big dreams and not be active in them. Don’t downplay yourself – whatever you are good at, be proud of that. Start doing something: Style mannequins, work in retail, join THREADS. Styling is not just about fashion. You have to deal with budgets and know how to manage people. Logistics is probably the biggest thing you need to learn as a stylist – calendars, travel, tailoring, sourcing fabrics. Don’t sell yourself short – I would hire someone with no experience if you have a great personality and you’re trying to work hard. Throw your net wide – you can’t have tunnel vision. You can’t be so hard on yourself that you don’t allow yourself to think outside the box.